2005-12-08. New. Ships with Tracking Number! INTERNATIONAL WORLDWIDE Shipping available. Buy with confidence, excellent customer service! 2005-12-08. Good. Ships with Tracking Number! INTERNATIONAL WORLDWIDE Shipping available. May not contain Access Codes or Supplements. May be ex-library. Shipping & Handling by region. Buy with confidence, excellent customer service! 2010-09-08. Good. Ships with Tracking Number! INTERNATIONAL WORLDWIDE Shipping available. May not contain Access Codes or Supplements. May be ex-library. Shipping & Handling by region. Buy with confidence, excellent customer service! 2017-10-12. New. Ships with Tracking Number! INTERNATIONAL WORLDWIDE Shipping available. Buy with confidence, excellent customer service! [ San Francisco]: The Grabhorn Press, 1927. Parchment backed boards. Colored decorations by Valenti Angelo. One of 240 copies printed by the Grabhorns. A bit of wear at head and toe of spine, parchment naturally mottled, otherwise a nice copy. CLARK A18.31. GRABHORN 93. Kessinger Publishing, LLC. Hardcover. 1161556818 Like New Condition. . Fine. Kessinger Publishing, LLC. Hardcover. 1161556818 New Condition. . New. 1927. [GRABHORN PRESS]. HAWTHORNE, Nathaniel. THE GOLDEN TOUCH. (San Francisco, CA): The Grabhorn Press, 1927. Limited edition; one of 240 copies. Two hand-colored drawings by Valenti Angelo, the Grabhorn device on the title-page and a headpiece. 35 pp. Small 4to., parchment-backed decorated paper boards, gilt title to spine. Lacks the slipcase. Some soiling to spine, and a touch of wear at crown, else fine. London: The Grabhorn Press, 1927. Hardcover. VG/VG- (Some wear and soiling to slipcase at extremities). Valenti Angelo. Slipcase covered in blue paper; Blue and green illus. paper over boards; White paper at spine; 35 pp. ; 2 color illustrations. Nathaniel Hawthorne's version of the myth of King Midas; One of 240 copies in this edition. Whittlesey House / McGraw Hill, 1959. First Printing. Gilt decorated red cloth. Tiny scuff on front paste-down (inside front cover) else a Fresh, unmarked copy. Unclipped ($2.50) jacket is lightly edge rubbed + has two very small edge tears. Color illustrated by Paul Galdone.. First Edition. Hard Cover. Very Good/Very Good. Illus. by Galdone, Paul. New York: Whittlesey/ McGraw Hill, 1959. Book. Near Fine. Hardcover. 1st. The Midas story from Greek mythology. Foreword: Anne Thaxter Eaton. Nonames, clean text. Handsome! Paul Galone artwork. near fine, vg lightly chipped taped dj, orange cloth.NOT ex-libr 61 pgs. LONDON: CONSTABLE & CO LTD. VG in pictorial boards. DOORWAY TO THE STORIES OF THE HEROES OF ANCIENT GREECE. REPRINTED FROM HIS WONDER BOOK. INK NAME ON FFEP. .
(Mount Vernon, N. Y. ): Peter Pauper Press. Very Good. N.D.. Hardcover. 1/385 copies. Illustrations by Valenti Angelo. Tan silk covers with paper labels. The covers are slightly soiled with rubbed spine ends and corners. The contents are bright and complete. Near Very Good. .
Peter Pauper Press, 1935. Book covered with plastic wrapper, which has been scotch-taped to end pages; tape is now browning. Comes in heavily worn slipcase, which has scotch tape repair along upper edge and a 1 1/4" piece out of lower edge. Limited edition of 385.. Limited Edition.. Hard Cover. Pages clean, binding firm.. Slipcased Hardcover. Good. Illus. by Valenti Angelo. New York, NY: Mc Graw-Hill Book Company, 1959. Hard Cover. Near Fine. 8vo - over 7¾" - 9¾" tall. Rare version of this book. Collectible children's book. Reading level 2nd Grade & up. Scott, Foresman Invitations to Personal Reading Program. Hawthorne's retelling of the myth of King Midas whose greed for gold spawned a tragedy, illustrated red & gold highlighted line-drawings by Galdone. Foreword by Anne Thaxter Eaton. 61 pages. Top & bottom of spine and 4 outside corner tips slightly bumped. Prev. owners sticker on top right corner inside front cover. Crayon scribbles on Ffep. Slight scuffing on front & rear cover..
Hawthorne, Nathaniel; illustrated by Richard Salvucci. New York:: St. Martin's Press,, (1987). Fine in near fine dust jacket (sunning to spine and edges of dj). First printing. 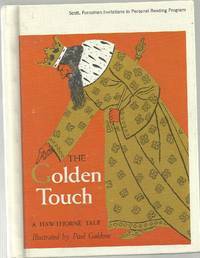 Classic story by Hawthorne, a retelling of the King Midas tale, illustrated by Richard Salvucci as a title in the "Night Lights - A Glow In The Dark Book" series. Small square format. 32 pp. LONDON: CONSTABLE & CO LTD. VG. REPRINT. DOORWAY TO THE STORIES OF THE HEROES OF ANCIENT GREECE. REPRINTED FROM HIS WONDER BOOK. INK NAME ON FFEP. .
New York, NY, U.S.A.: Saint Martin's Press, LLC, 1987. (Night Lights--pages glow in the dark.) Gold seal at top left of DJ: Night Lights: a Glow in the Dark Book. DJ spine faded, Near Very Good DJ/Very Fine book.. Hard Cover. Fine/Near Very Good. Illus. by Salvucci, Richard . NY: St. Martin's. Fine in Fine dust jacket. 1987. First Thus; First Printing. Hardcover. 0312572840 . 32 pages; Fine/Fine. Boards are straight, tips are pointed, spine is square and page are clean. DJ is super! In protective sleeve. An excellent gift! Nathaniel Hawthorne wrote many classic Literature books but also wrote quite a few children's books. This is one. Switch on Night Lights - brilliantly illustrated, classic stories with a brand new twist. There is a secret in each picture - a glowing element that only comes out in the dark... .
Whittlesey House, McGraw Hill. Used - Good. Former Library book. Shows some signs of wear, and may have some markings on the inside. Published by Constable and Company Ltd., 10-12 Orange Street, London circa 1900 [Reprinted from the Author's Wonder Book for Boys & Girls. First Published in America in 1851]. 1900., 1900. Hard back binding in publisher's original illustrated grey paper covered boards with colour illustrated oblong paper onlay. 8vo. 8½'' x 7''. Contains 26 printed pages of text with full-page colour plates and monochrome illustrations throughout. Spine ends scuffed, age tanning to the end papers and in Very Good condition, no dust wrapper. Member of the P.B.F.A. New York: St. Martin's Press, 1987. Hardback: dj is faded and lightly creased, lightly foxed on reverse, pages lightly finger creased and a few small marks, vg. small square 4to, 32pp. Illustrated by RICHARD SALVUCCI with colour pictures which have a glow in the dark aspect.. First Thus. Hard Cover. Very Good/Very Good. Illus. by Richard Salvucci. Whittlesey House, 1959. Book. Illus. by Paul Galdone. Very Good. Hardcover. Small picture book. DJ has chips and tears. Interior of the book is clean and bright. The story of King Midas..
Jack Lake Productions, 2011. Digital. Acceptable. Disclaimer:A readable copy. All pages are intact, and the cover is intact. Pages can include considerable notes-in pen or highlighter-but the notes cannot obscure the text. Jan 01, 1959. Hardcover. Very Good. Buckram bound school library. VG++ NICE! New York, Toronto, London: Whittlesey House, 1959. A very good illustrated greeny gold cloth hardcover. School ex-library. Pages are bright and tight, brimming with black and white and color illustrations. Fifth printing, 1959.. Illus. by Paul Galdone. St. Martin's Press, 1987. Hardcover. Good. Disclaimer:A copy that has been read, but remains in clean condition. All pages are intact, and the cover is intact. The spine may show signs of wear. Pages can include limited notes and highlighting, and the copy can include previous owner inscriptions. At ThriftBooks, our motto is: Read More, Spend Less.Dust jacket quality is not guaranteed. St. Martin's Press, 1987. Hardcover. Very Good. Disclaimer:A copy that has been read, but remains in excellent condition. Pages are intact and are not marred by notes or highlighting, but may contain a neat previous owner name. The spine remains undamaged. At ThriftBooks, our motto is: Read More, Spend Less.Dust jacket quality is not guaranteed. Scott Foresman. VG/na. Hardback. Special Scott Foresman Invitation to Personal Reading edition. Cover has light rubbing & edgewear. Library card pocket in back, but no stamps or other typical library markings. Overall clean & tight copy. New York: McGraw-Hill Book Co., 1959. Scott, Foresman Invitations to Personal Reading Program. Pictorial boards are scuffed and worn with edgewear. Usual library markings. Pages are clean, text has no markings, binding is sound. . Hard Cover. Good -/No Jacket. Illus. by Galdone, Paul. 8vo - over 7¾" - 9¾" tall. Ex-School Library. St. Martins Press 1987. Hardcover with dust jacket. Taken from the book A Wonder Book for Boys and Girls. Beautiful full-page color ill. by Richard Salvucci. King Midass fondest wish, to have everything he touches turn to gold, backfires on him. 32 pp. 0312572840. NOT ex-lib. Near-Fine, previous owners name. Whittlesey House. Hardcover. B000OFMSJW 1959 Whittlesey House pictorial hardcover. Ex-school copy with just an id on the front cover. Despite coming from a school the book is still in very good condition. Some personal id stamps on the end pages. . Very Good. McGraw-Hill. HARDCOVER. 1/1/1959. 59-10711 :Good Special Scott, Foresman and Company Edition for the Invitations to Personal Reading Program with school stamp inside front cover, pocket inside back cover, light cover rubs, binding tight, pages unmarked. Illustrated by Paul Galdone . Used - Good. McGraw-Hill Book Company, 1959, 1/1/1959. Unknown Binding. Good. . Clean & tight. Ex-Library. Hardcover. Great condition for its age. Minor wear. 1959 Ed. New York: Whittlesey House. Fair/deco cover. 1959. 4th printing. Hardback. Square 8vo x-library copy/stamps/discards/etc. Foreword by Anne Thaxter Eaton . Whittlesey House - McGraw Hill Book Co, 1959. Hard Cover. Good/No Jacket. Illus. by Paul Galdone. St. Martin, 1987. Hard Cover. Very Good/Very Good. Illus. by Salvucci, Richard. Whittlesey House / McGraw Hill Book Company, Inc., 1959. Hard Cover - VG - No dust jacket if issued - Book is clean and tight with only light wear to cover - Ex-Library - Illustrated.. Hard Cover. Very Good. Ex-Library.